Suitest provides advanced tools for developing and testing HbbTV and Freeview Play applications on Smart TVs and set-top boxes featuring a traditional infrared remote control. After setting up the device you will be able to create and execute automated end-to-end test scenarios as well as debug your applications directly on the device. HbbTV / Freeview Play devices are operated by the CandyBox. You can purchase the CandyBox through your account. A single CandyBox can independently control 8 or 40 devices and you can have as many CandyBoxes as necessary attached to your account. If you don't have a broadcast playout stack in place, you could be able to utilize one of the public TV channels. Verify that your device is connected to the Internet. Some devices (most notably Samsung) have their HbbTV support turned off, consult your device manual or browse the device settings and turn the HbbTV support on. 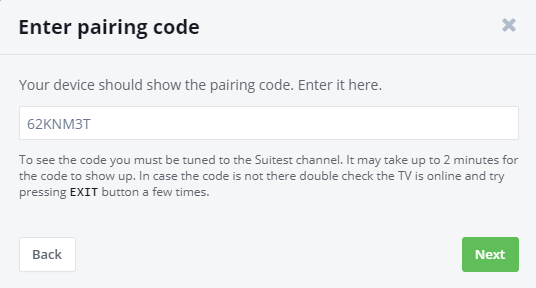 Tune the device to the.suite.st channel and wait a couple of minutes for the Suitest pairing screen to appear. After the Suitest channel is running and the infrared blaster is installed everything is ready for the device to be added to your Suitest account. Open the Device wizard, select Add physical device, choose HbbTV / Freeview Play from the platform list and then press Next. The pairing code screen on the device should disappear at this point. The process of assigning a driver is similar for all platforms and is in the Smart TV's article. After you complete the driver verification process your HbbTV or Freeview Play device will be added to your Suitest account. 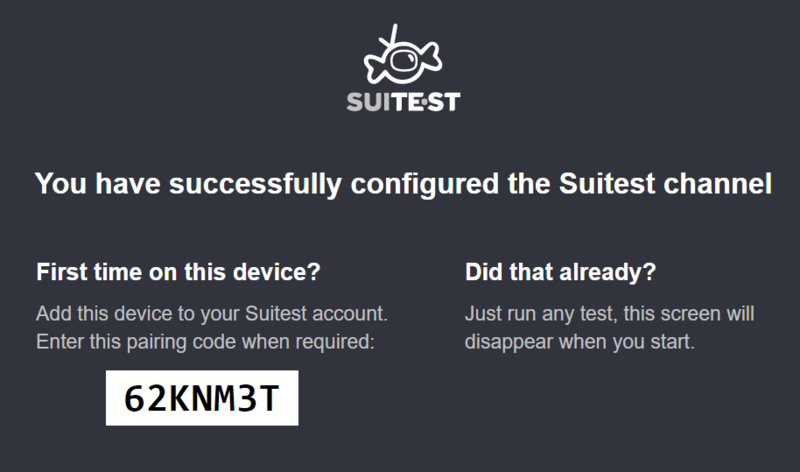 Before the test execution starts the Suitest channel needs to be open on the device. In order to avoid the effort of manually tuning to the channel every time you can specify a boot sequence which is a sequence of keys that Suitest should press in order to get the channel to open. Here are the recommendations on how to create a reliable boot sequence for a particular device. Now that you have your HbbTV or Freeview Play device configured, it's time to instrument your app and start testing.